Docent Kathryn Hansen shows a Lois Lenski illustration of the Betsy-Tacy books and compares it to the neighborhood today. If you need proof, you need only show up in Mankato on a Friday or Saturday afternoon in summer. You’ll find Betsy-Tacy fans who’ve come from around the world to visit the trim little Victorian houses on Center Street, “Betsy’s House” and “Tacy’s House,” where Hart Lovelace and her real best friend, Frances Kenney, grew up right across the street from each other. Little girls and their grandmothers, mother and daughters, and adult “gals on getaways” line up for a tour of the real-life houses that are the setting of the beloved book series. The houses have been lovingly restored and designated as national literary landmarks. The houses are open on weekends year-round but Betsy-Tacy fans show up en masse each June for the Deep Valley Homecoming—this year from June 26-30— like a children’s book Coachella. (Deep Valley is the name Hart Lovelace gave her hometown in the books.) Activities include Betsy & Tacy home and neighborhood tours, narrated horse-drawn trolley rides, a Victorian Tea, Deep Valley Book Festival*, fashion show, living history actors, speakers and re-enactments, a vintage car show and more. The old fashioned kitchen at Betsy’s house offers a view of life in the early 1900s, straight from the Betsy-Tacy books. 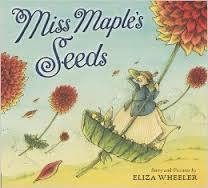 Enthusiastic docents regularly lead tours of the houses and point out how the homes and the neighborhood compare to the books’ illustrations by Lois Lenski. From the old-fashioned kitchen, to the lace curtains and fine china, to the books and Maude Hart Lovelace memorabilia, tours furnish a cultural snapshot of the era, a chance to experience what it was like to live in a Midwestern town when the first automobile arrived and homes got their first telephones. But beyond a nostalgic connection to a fictional world or a look at old houses with creaky floors and Victorian furniture, a visit to the Betsy-Tacy houses offers a look at the lives and friendships children, the aspirations of women at the turn of the last century, and celebrates girls who are, while old-fashioned, strikingly independent and adventurous. While old telephones may be the highest tech you’ll experience on the tour, Betsy and Tacy aren’t totally off the grid. You’ll find constant discussion about them on Twitter and Pinterest. *I’ll be at the Deep Valley Book Festival this year, signing copies of Off The Beaten Page: The Best Trips for Lit Lovers, Book Clubs and Girls on Getaways. Mankato is about an hour and a half south of the Twin Cities via I-169. The houses are open this summer on Friday and Saturday from 1:00 p.m. to 4:00 p.m. Admission is $5 for adults, $2 for children (under 5 free). Download the Discover Deep Valley brochure for a walking tour of the area. We picked up bagels at Tandem Bagels, 200 E Walnut St., for a picnic in Lincoln Park, which figures in the books and is set amidst a gorgeous grouping of Victorian homes. As a planner of family vacations, it took me a long time to reconcile my list of all the great things I wanted to show and teach my sons with the list of what might really interest them. That was especially tough when it came to cities. At one point, as we dragged our kids through the British Museum, one of the boys declared that he had “reached maximum cultural saturation.” He just couldn’t visit one more museum, cathedral or fancy garden. Truth be told, the adults felt the same way. Lonely Planet (the people who publish all those guidebooks for adults) offers a terrific series of “Not-For-Parents” guidebooks that can help avoid a case of MCS on your next family vacation. The company sent me several copies to review and I’m now ready to gather up a few kids and take a trip. One of my favorite things about travel is anticipating the trip. It’s a holdover from when I was a kids my mom took me to the library to load up on books that took place in the areas where we were going. Reading ahead of time offers a preview of coming attractions— what the food is like, historic things that happened there, what the buildings look like, animals you might see— things like that. The series is a perfect way to to encourage such anticipation and to help children and families get the most from their trips. The books, as the company says, “open up a world of intriguing stories and fascinating facts about the people, places, history and culture of the world’s most exciting cities,” but they do it in a way that’s energetic and appealing, even for adults. The three books I have cover “Everything You Ever Wanted to Know” about Europe, Paris and New York. They feature the inside scoop on each city with bright colors, crazy pictures and cartoons, and a combination of information that ranges from history and fashion, to scenes from movies and gross food that people may eat there—like snails in Paris. In the New York book, you’ll find Andy Warhol, rats and musicians in the subways, a look at Ellis Island and favorite NYC sports teams, and a lot of other fun stuff. So, no more MCS. 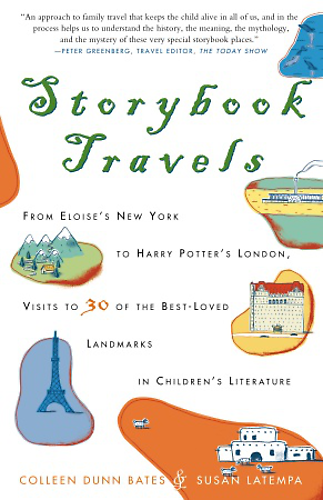 And, even if you’re not planning a major trip, these books make great summer reading and armchair travel for kids. Lonely Planet also offers a helpful page on How to Travel Like a Kid that adults will want to read, just to remind themselves how to keep family trips kid friendly. If you’ve spent any time reading this blog, you know my goal is to encourage people to READ and GO. Literary travel means reading a great book and going where it takes place or to the type of place the book is set, which can be right in your own town. Literary travel allows you to experience both the book and the place in a more intimate way. And, it’s a great way to expose children to the pleasures of reading, giving them more ways to relate to books and their subjects. 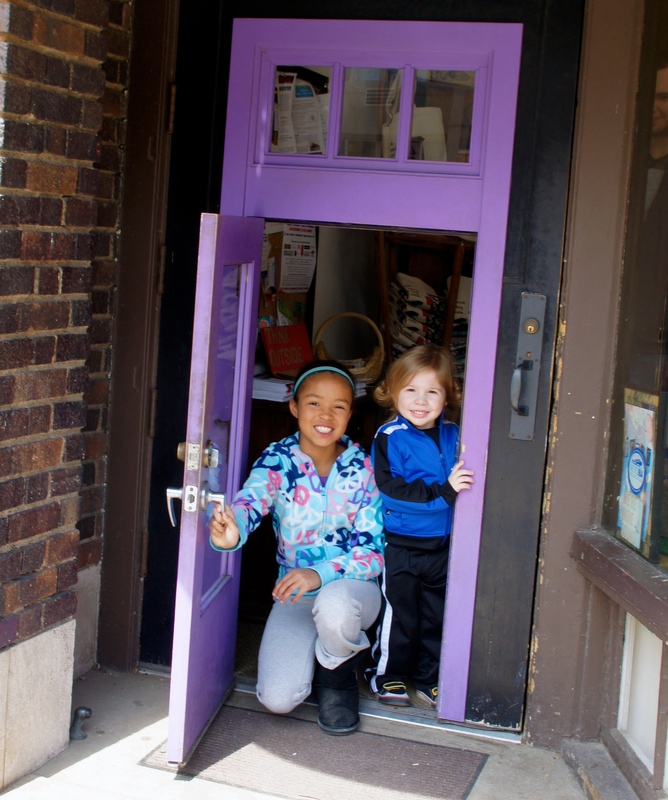 Exiting Wild Rumpus through the child-size purple door. 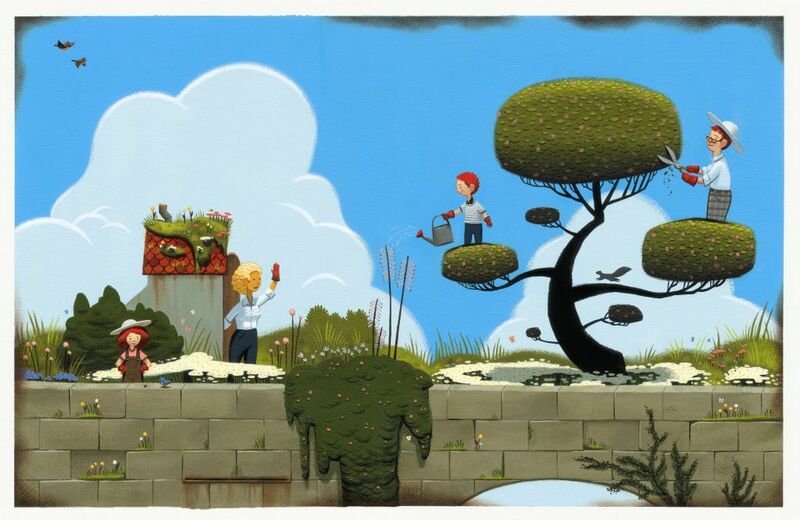 concept of caring for the environment than by reading a super-engaging book on the topic and then venturing out on a lit trip to a local park, garden, or community Earth Day event? Listen up grandparents, aunts and uncles and others who seek interesting ways to interact with the children in your life. You should put Last Child in the Woods: Saving Our Children From Nature-Deficit Disorder on your list. For a few great book suggestions, I stopped by one of the country’s all-time best children’s bookstores, Wild Rumpus in Minneapolis. 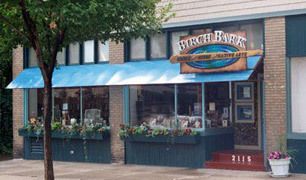 I have to admit that since my children are grown, I look for just about any excuse to wander into this store, which is full of fun booksellers, live animals, special events, and cozy reading spots, not to mention books, books, books. It’s pretty entertaining just watching children and their families interact with everything in the store. Don’t have kids? 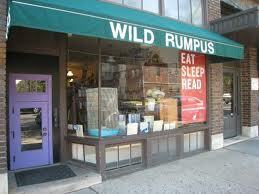 Wild Rumpus has a great selection of YA and adult books, and you can still enjoy the animals. You never know what fabulous things you’ll find when you open a children’s book. 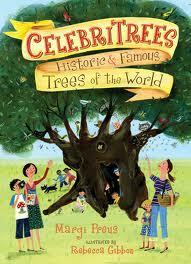 fabulous creatures, I felt like there was just no telling what you might find in in the pages of each new book. Reading leads to a richer life, beyond imagination and entertainment. 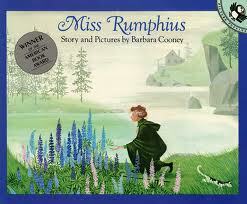 Children who are read to become skillful readers themselves. Skillful readers do better in school. In fact, if you want your children to do well on their SATs, make sure they read a lot. Even more basic, reading plays a crucial role in brain development and language skills. As I mentioned in a previous post about the children’s literacy program at Hennepin County Medical Center in Minneapolis, studies show that low reading skill and poor health throughout life are clearly related. 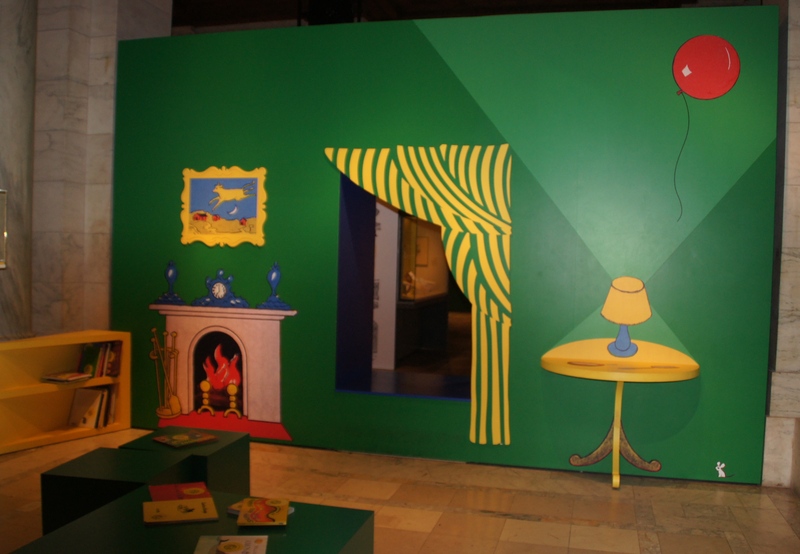 A walk into Good Night Moon at NYPL brings back memories of reading to my own children. If you’re in or around New York City anytime soon, the fabulous Morgan Library will feature The Little Prince: A New York Story January 24 through April 27. You can read more about the Morgan Library in my Literary Walking Tour of Midtown New York City and in Off The Beaten Page: The Best Trips for Lit Lovers, Books Clubs and Girls on Getaways. 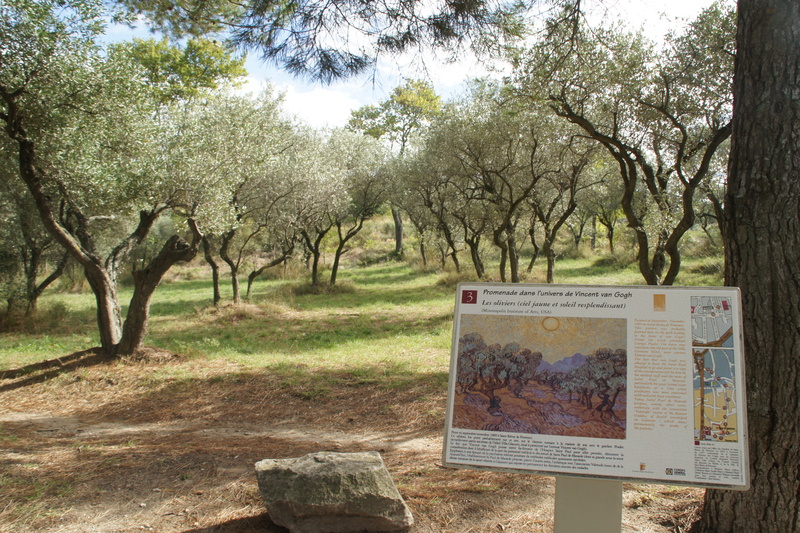 At St. Paul de Mausole near St. Remy, France, you can see exactly what Vincent Van Gogh saw and painted. The gnarled olive trees, irises, lavender, and bright sunshine…Entering the Monastery of St. Paul de Mausole in St. Remy de Provence in southern France you have a feeling that you’ve seen this place before. That’s because you have. 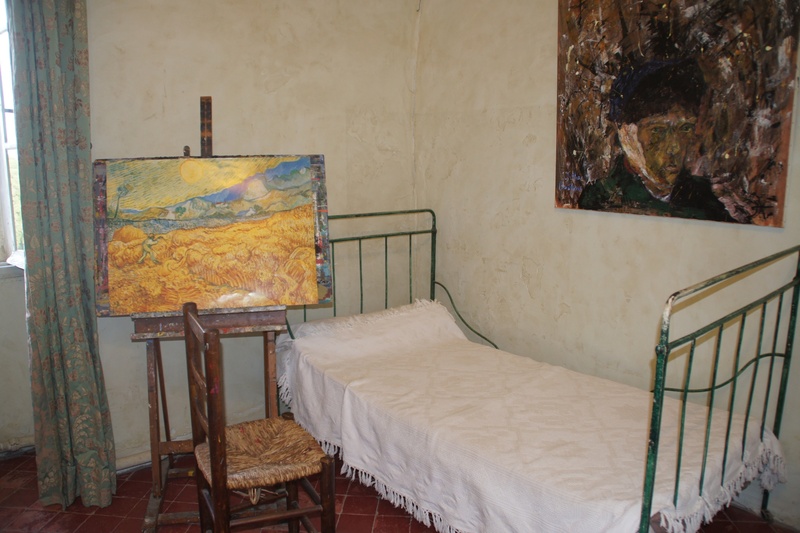 Van Gogh’s room is reproduced at the asylum in St. Remy, France, where he lived for a year and painted over 100 paintings. This is the “maison de sante,” not far from Arles, where Vincent Van Gogh went to rest and recover his mental health in 1889, not long after the famous incident when he cut off his ear. He stayed here roughly one year and during that time he painted anything and everything in his surroundings–143 oil paintings and more than 100 drawings including two of his most famous masterpieces, Irises and The Starry Night. The fabulous thing about visiting St. Paul de Mausole is that photos of the paintings and and information about them appear where they were painted. So for example, a photo of “Les Oliviers,” which is now in the Minneapolis Institute of Arts, is posted right in front of those olive trees. You feel a little chill when you see exactly what he saw and how he interpreted it. 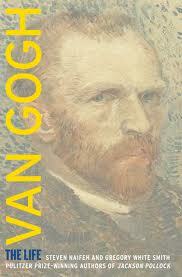 You’ll enjoy your trip more if you read up about Vincent. Irving Stone’s fiction classic Lust for Life provides a general knowledge of his story. But scholars continually interpret both his art and the health problems that may have been at the source of his mental illness. Most recently, Van Gogh: The Life by Steven Naifeh and Gregory White Smith offers a very readable portrait of Van Gogh and puts forth the idea that rather than committing suicide, Van Gogh was murdered. Traveling with kids? 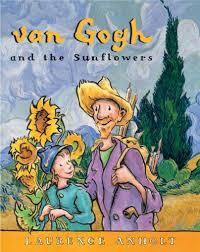 They’ll want to read van Gogh and the Sunflowers by Laurence Anhold. Journey: Americans in Paris, on Tuesday night in Wayzata, Minnesota, near Minneapolis. It’s the story of American artists, writers, physicians, politicians and others who traveled to Paris between 1830 and 1900 to further their education and to excel at their work. I highly recommend it to anyone traveling to Paris. But one of the most interesting parts of the evening was when someone asked McCullough his opinion of Americans’ knowledge of history and the way history is taught in our schools. That’s a particularly hot topic this week because of Sarah Palin’s rewriting of history and also because the National Assessment of Educational Progress found that American students are less proficient in their nation’s history than in any other subject. The New York Times said that, according to results of a nationwide test released on Tuesday, most fourth graders were unable to say why Abraham Lincoln was an important figure. McCullough’s suggestion: don’t fault the teachers. It’s our own responsibility. Parents, grandparents, and others must do a better job of showing an interest in history and discussing it with children. Family road trips are one of the best ways to do that. It’s what educators call “placed-based learning” and, it ties in nicely with the idea of inspiring children to read by making stories more vivid and bringing reading to life. I’m not talking about hard-core history books here, but rather books that are fun to read. 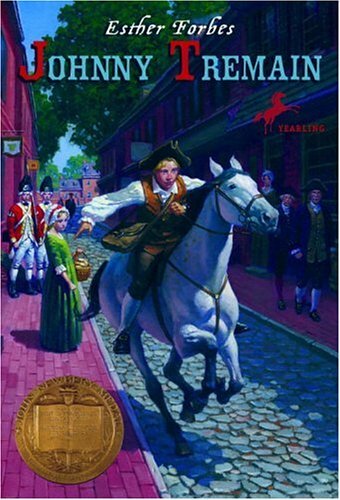 For example, read Esther Forbes’ Johnny Tremain and visit Boston. Pair Mark Twain’s Huckleberry Finn or Tom Sawyer with a trip to see the Mississippi River or Twain’s home in Hannibal Missouri. Read the Little House on the Prairie series and travel to the sites where Laura Ingalls Wilder really lived. How about Brighty of the Grand Canyon? Remember that one? The list goes on. Not only do lit trips fuel a young reader’s imagination, they also give a sense of history and an understanding of what life was like earlier in our history. 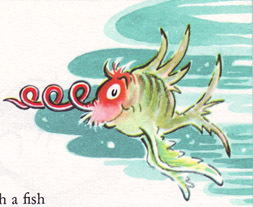 I can’t resist this one about Dr. Seuss-like places. So, with a tiny bit of research, you could pair a book about Abe Lincoln and a trip that would show both kids and parents why Abraham Lincoln was important… or why Paul Revere made that famous ride.